DENVER (AP) — Tim Tebow inspired a phenomenon when he dropped to a knee and began praying as his teammates wildly celebrated around him after an improbable overtime victory in Miami last weekend. 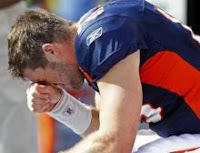 That was simply Tebow "Tebowing," a phrase coined by a fan sitting in a bar in New York watching the popular yet polarizing quarterback rally the Denver Broncos. Jared Kleinstein was mesmerized by Tebow's peaceful demeanor kneeling on the turf amid all the chaos that ensued. He launched a website in which fans could submit photos of themselves "Tebowing," which means getting down on a knee and praying, even if everyone else around you is doing something completely different.